Few places evoke the rise and fall of Japan’s industrial might than the head office of the Imperial Steel Works in Kitakyushu. The red brick Meiji Era building was the heart of the nation’s first big steelworks. Now it’s a UNESCO World Heritage site. Kitakyushu, with nearly a million people, embodies the struggle of Japan’s cities to adapt to a future where citizens are older, workers are fewer and many houses are emptying. The emblems of government efforts to revitalize the economy — a billion-dollar airport, a robotics factory — stand beside the empty lots, an idle blast furnace and shuttered shops. Five hours west of Tokyo by shinkansen, Kitakyushu lost over 15,000 people in the five years to 2015, more than any other city in the country apart from those evacuated because of the Fukushima nuclear disaster. More than 100,000 residents have gone since the peak in 1979, and half of the factory jobs have disappeared with them. Provincial cities are competing for a declining pool of talent, workers and investment to replace vanishing industries. Kitakyushu’s task is especially stark because of the contrast with Fukuoka, an hour’s drive southwest, where efforts to lure entrepreneurs have made it one of the few big cities outside Tokyo whose population is growing. Kitakyushu, formed by the merger of five towns in 1963, owes its manufacturing roots to the Imperial Yawata Works, which poured its first steel in 1901. Today, the mills are run by Nippon Steel & Sumitomo Metal Corp., with about 4,200 staff making high-value products such as shinkansen rails. The company declined an interview request. At its peak, the works had nearly 50,000 people, said Akinori Yamamura, 78, who worked there for four decades. The city was so vital to industry during World War II that it was the original target for the second U.S. atomic bomb, which was eventually dropped on Nagasaki because of clouds and poor visibility over the Kitakyushu area. The city’s mills attracted steel-consuming businesses such as Toyota Motor Corp. and Nissan Motor Co., which still have major plants in the area. 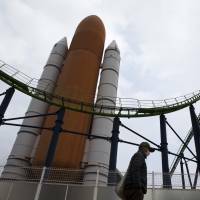 Other parts of the steelworks have also been listed by the United Nations Educational, Scientific and Cultural Organization, including a repair shop that is still in operation after more than a century. 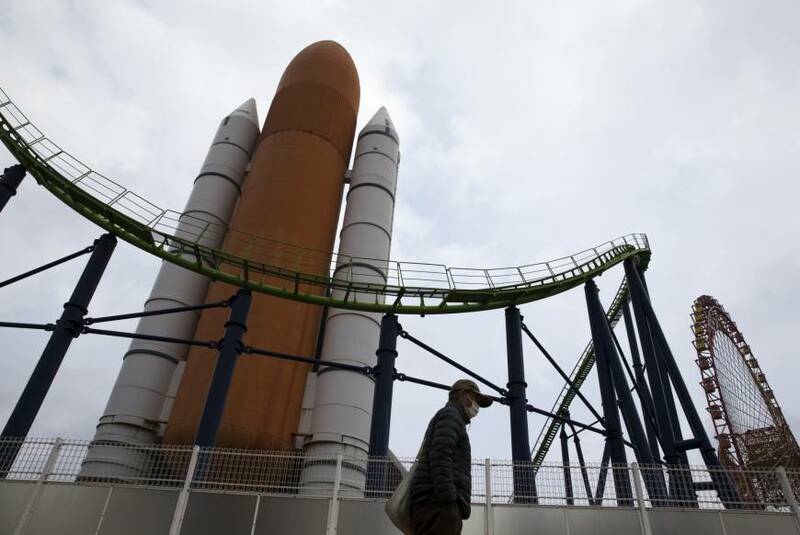 The Space World amusement park set up in 1990 at Yawata Works’ idle land, will close at the end of this year. “It’s not easy to create a new industry. It’s a hard-fought battle,” said Kitakyushu Mayor Kenji Kitahashi, 64. He’s looking to encourage growth from sectors like tourism, robotics, health care and offshore wind power. One of the primary tools in his arsenal is the airport. Opened in 2006 on an artificial island in the bay after 12 years of construction, the 24-hour airport gives Kitakyushu an advantage over Fukuoka, whose downtown runway has to close at night due to noise. One Kitakyushu company that managed to adapt is robot-maker Yaskawa Electric Corp., which started in 1915 making electric motors and now produces Motoman industrial robots. The company’s stock has risen 75 percent in the past year. High-tech toilet-maker Toto Ltd. and airline Star Flyer Inc. are also based here. But Kitakyushu’s strategic special zone status granted by Prime Minister Shinzo Abe in 2016 has more to do with demographics than its industrial heritage. The city was designated as an area for innovation in elderly care. Even that sector is struggling. Almost 30 percent of Kitakyushu’s residents are 65 or older. Kamei herself is 61. “I think our future lies in tourism,” she said, ruefully.